In the fall of 1979, my father Jack went to work for Kahn's-Hillshire Farm. At the time my family lived in Maryland and my father was responsible for the sales of Hillshire Farm kielbasa and smoked sausage products. His territory encompassed the entire state of Maryland, the District of Columbia, Northern Virginia, and parts of Delaware. During that time, Boston Red Sox outfielder Carl Yastrzemski worked as a spokesman for Kahn's-Hillshire Farm. Being a well-known baseball player with a memorable Polish last name, Yastrzemski was the perfect fit to help the company grow its kielbasa and smoked sausage market share. 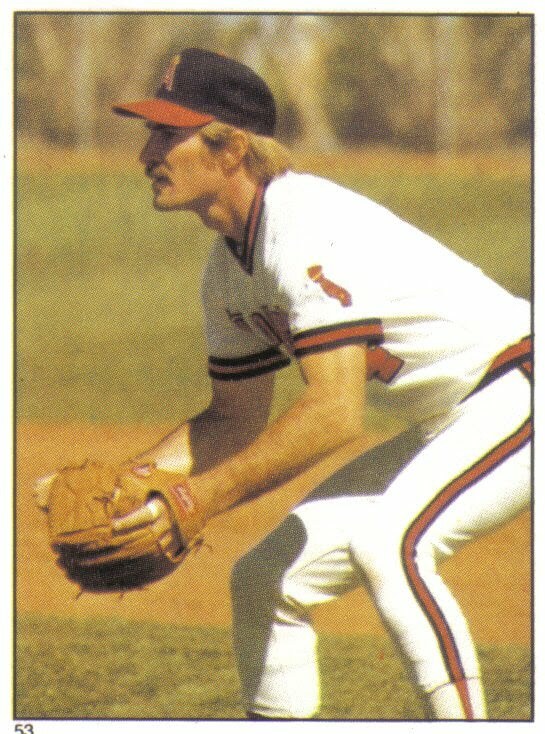 When Yastrzemski and the Red Sox came into town to face the Baltimore Orioles, my father got the unique opportunity and rare privilege to work alongside and get to know a future Hall of Fame baseball player. 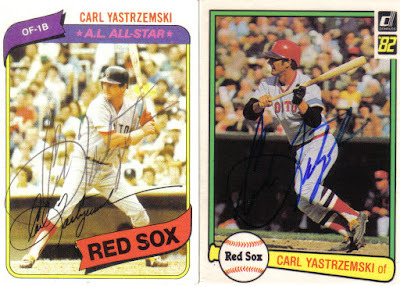 Over the years, my father has recounted his memories of Yastrzemski and shared his autographs, pictures, and other keepsakes given to him by the Red Sox legend. Carl Yastrzemski's lengthy major league career spanned from 1961 to 1983. During his career, Yastrzemski won numerous awards including an MVP, three batting titles, and seven Gold Gloves for his left field defense. 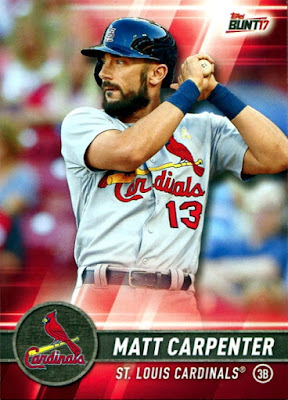 Moreover, he achieved several milestones including 3,000 hits, 450 home runs, 600 doubles, along with 1,800-plus RBI and runs scored. In 1967, Yastrzemski became one of a select group of players to complete the Triple Crown by leading his respective league in home runs, RBI, and batting average. Yastrzemski spent his entire major league career playing for the Boston Red Sox and became affectionately known by the nickname Yaz. In 1989, Yastrzemski was voted into the Baseball Hall of Fame on his first year of eligibility with a whopping 94.6% of the vote. 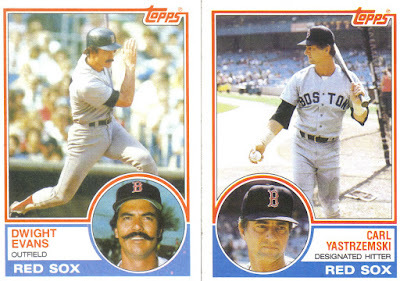 Yastrzemski was raised on a 70-acre potato farm on the Northeastern side of Long Island in Bridgehampton, New York. Coincidentally, my father also grew up on a farm, spending his formative years on the 160-acre family homestead in the small town of Twin Lakes, Minnesota. Growing up on a farm helped instill the hard work ethic that enabled Yaz to complete 23 seasons in the majors and play in an astounding 3,308 games--an all-time record at the time of his retirement. Like Yaz, my father was known for his dedication to the job and could certainly be described as a workaholic. Although my father had the strength and speed to play sports, his lack of hand-eye coordination prevented him from seriously taking part in athletics. Not surprisingly, my father did not closely follow sports though this likely helped him foster a good working relationship with Yaz who has generally kept a low profile for a famous baseball player and probably appreciated the chance to work alongside someone who was not star struck by his presence. 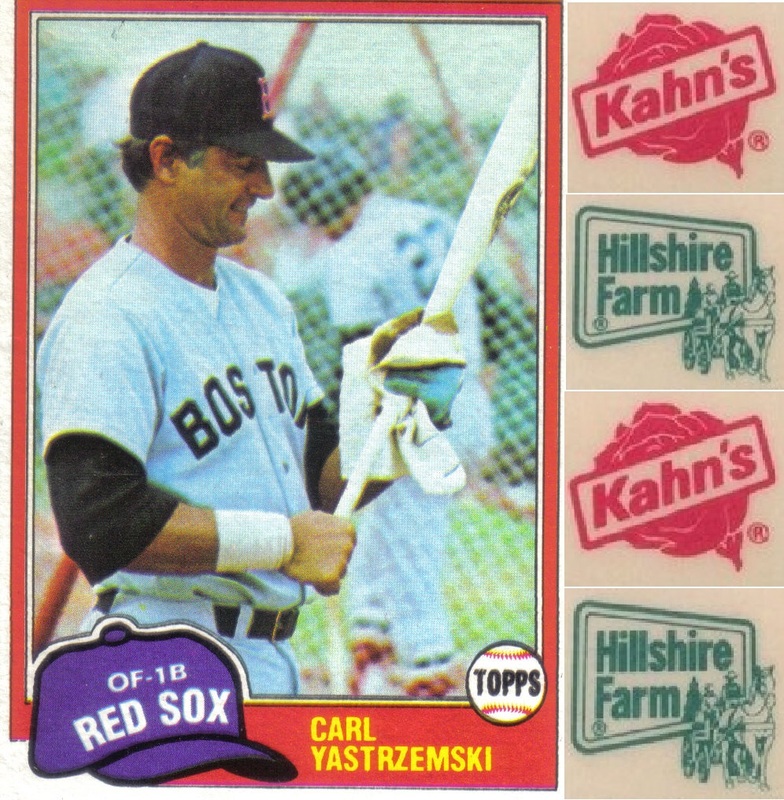 Yastrzemski started working for Kahn's-Hillshire Farm in 1976. Yaz’s role with the company went beyond just being a famous ballplayer who appeared on their packaging and in their ads. 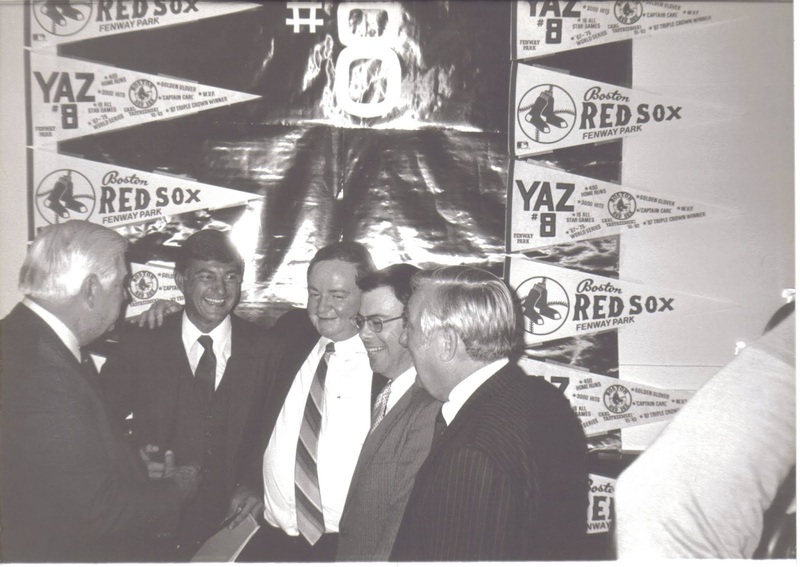 In fact, a New York Times article from September 1979 stated that Yaz “spends two weeks a year at the (Kahn’s-Hillshire Farm company) headquarters in Cincinnati watching how meats are processed and learning the business.” My father also mentioned Yastrzemski being serious about Kahn's-Hillshire Farm's products and said the Red Sox outfielder would talk baseball with the buyers but also "talk about the ingredients and how it was made as well as point out that Hillshire Farm was the number one kielbasa and smoked sausage brand and the only one advertised nationally"
I never had the pleasure of meeting Yaz, though I would have been too young to remember him even if had. I asked my father to describe Yaz's personality and what he was like and he said, "Yaz was good to me. He was always nice to me and the people we had lunch with. He introduced me to other ballplayers on the team and he liked my boss, Sidney as well." 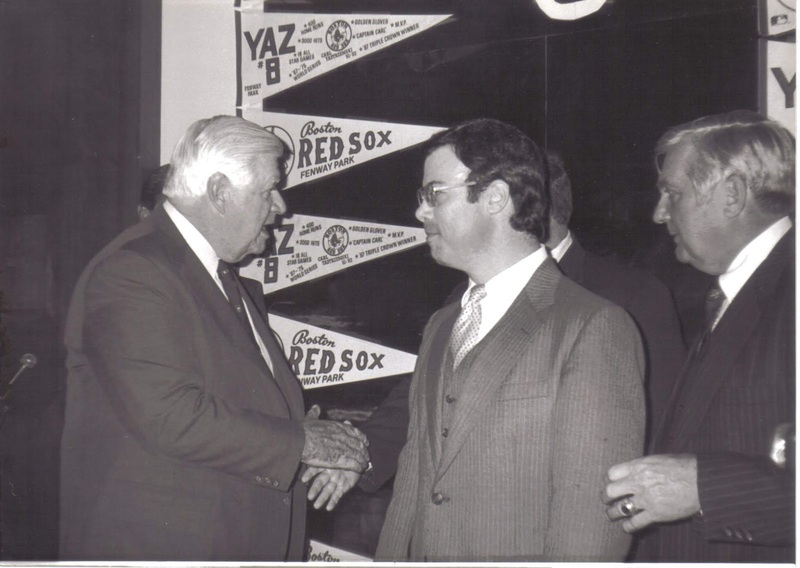 Yastrzemski is not the only Hall of Fame baseball player my father has had the opportunity to meet. 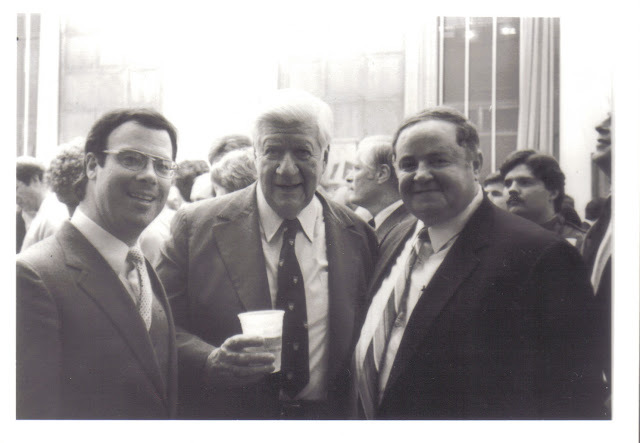 Since my father's boss, Sidney worked out of New York City, my father did a lot of traveling between the D.C. and New York City Metropolitan areas so it was not uncommon for him to spot famous people. In fact, my father regularly took the Eastern Air Lines Shuttle between Washington (now Reagan) National and La Guardia Airports where he once briefly met Johnny Cash and often saw national evening news anchors including Sam Donaldson who he humorously described as looking "demonic" in person. During one of his business trips to New York City, my father crossed paths with a legendary former New York Yankees player. "I went to a sales meeting at a hotel in Rye, New York which is north of New York City," my father recounted. "At 7'o clock, I got on the elevator to come down and eat breakfast and Joe DiMaggio was on the elevator. I said, 'Aren't you...?' and he said, '...Yeah, I'm Joe DiMaggio.' He said, 'I thought I was getting out of here before anybody'd recognize me. Then he asked me, 'You want a signature?' I said, 'Sure.' And he signed a piece of paper for me and got off the elevator and that was it." From what I remember the piece of paper DiMaggio signed for my father was from a small, light green manila notepad. Unfortunately, at some point during my childhood the signed piece of paper was lost. 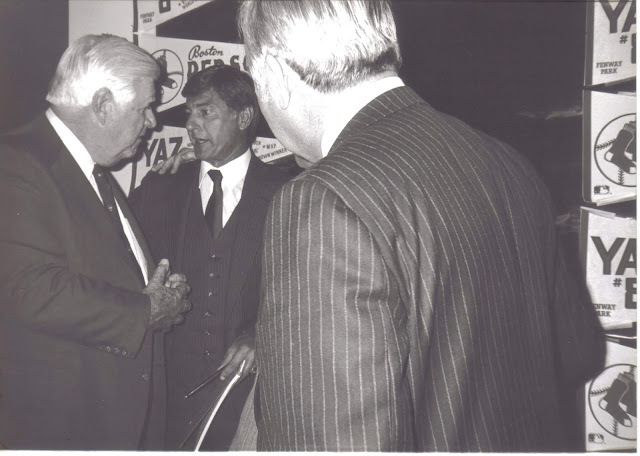 Due to working alongside Yaz, my father also got the unique opportunity to walk into a major league locker room when the Red Sox outfielder invited him and his boss, Sidney, into the visitor's locker room at Memorial Stadium after games against the Baltimore Orioles. "Sometimes Sidney would come down from New York when the Red Sox had a game in Baltimore and we would go to the game," my father remembered. "On a few occasions, Sidney and I got a chance to see Yaz in the Red Sox locker room after the game. Yaz introduced us to all these players, so it was quite a scene. Dwight Evans was real personable, he was real friendly to Sidney and I. I got to know Dwight Evans and he knew us by name. He really liked Sidney and liked me." Evans was one of Yastrzemski's closest friends on the team. 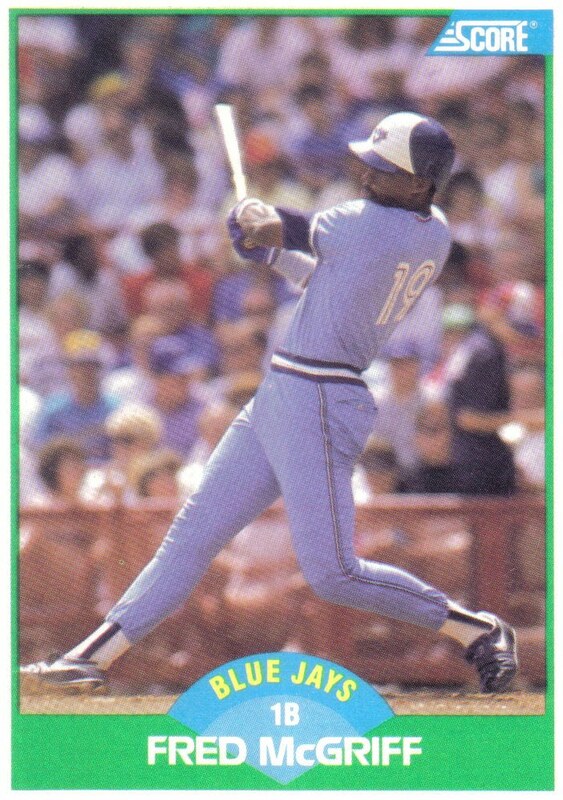 During the early-1980's, Evans evolved into one of the game's most dominant sluggers after being primarily known for his Gold Glove-defense in right field earlier in his career. Yastrzemski retired from baseball at the end of the 1983 season, bringing an end to a distinguished career that spanned 23 major league seasons. A testament to his hard work and dedication to the game, Yaz played well into his forties--with his final games coming just a few weeks after turning forty-four years old. Unfortunately, Yaz's Red Sox were unable to make a run at the AL East Division title in his final campaign, putting together a lackluster 78-84 record to finish 20 games out of first place. By contrast, my family's hometown Baltimore Orioles captured the AL East with a dominant 98-64 record to advance to the postseason behind the strength of solid performances by veteran mainstays such as Eddie Murray as well as up-and-comers like Cal Ripken Jr.
With the Orioles in the postseason, Kahn's-Hillshire Farm saw the playoff games as an opportunity to strengthen their relationships with the local supermarket buyers. "I got a phone call from the Vice President of Sales and he told me he was sending me a check by overnight mail that would be at my house at 9 o' clock in the morning," my father recalled. "I was instructed to go to this fancy hotel in the business district of downtown Baltimore and that I was going to get eight tickets to every playoff game and then when they got in the World Series, I got eight tickets for every World Series game. I was to give those to the buyers of the supermarkets and give them each two tickets to go to the games. However, before the first World Series game, Sidney told me, 'Take four tickets and take you and your family, and give the other four away and make sure you and the family go to one game.'" The Orioles defeated the Chicago White Sox in the ALCS to advance to the Fall Classic against the Philadelphia Phillies who had their own solid core of well-established veteran players which included Mike Schmidt, Pete Rose, Steve Carlton, and John Denny among others. The Series opened in Baltimore and my father decided to take my mother, my sister, and I to Game 1. Unfortunately, the O's were defeated by the Phils in Game 1 with Joe Morgan and Garry Maddox going deep to lead the visitors to a 2-1 victory. Being just a young child, my only recollections from that night is that it rained during the game and the Orioles lost. The seats my father was given were a little past the first base bag and--as luck would have it--situated just under the bleachers so my family stayed dry during the game. 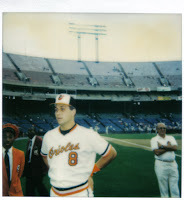 Fortunately, the O's rebounded from the Game 1 loss and took the next four games to win the Championship behind the timely hitting of catcher Rick Dempsey who was named the Series MVP and became both mine and my sister's favorite player for the duration of his time in Baltimore. 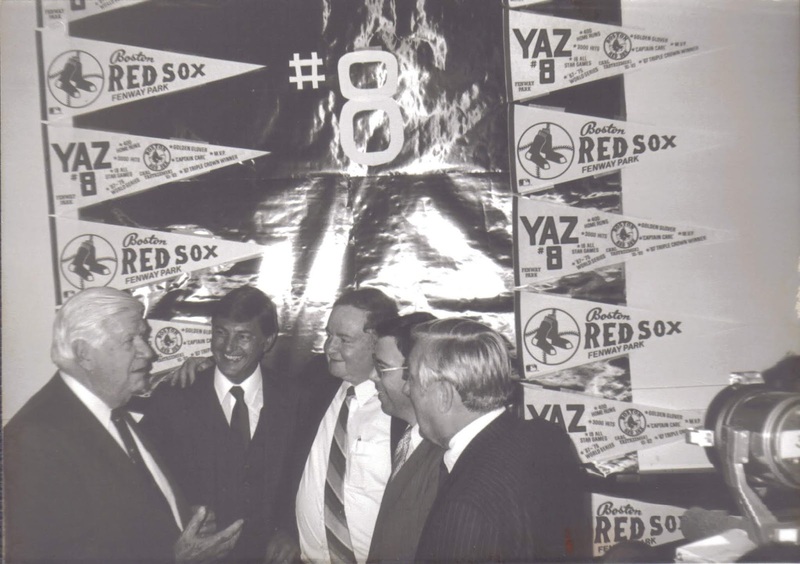 Following his retirement from professional baseball, Yastrzemski became marketing director of New England and Florida for Kahn's-Hillshire Farm. With his new position, Yastrzemski no longer regularly traveled to Baltimore, thus bringing an end to his lunch meetings with my father and the supermarket buyers. 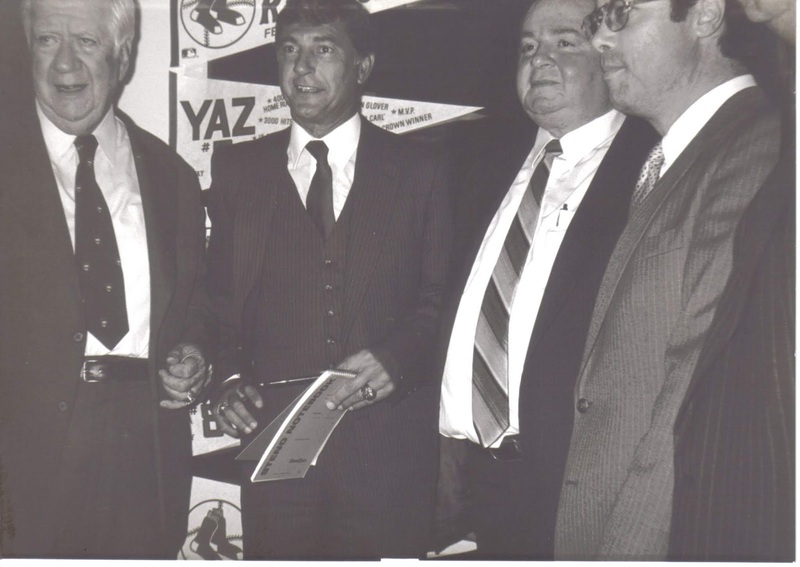 Nevertheless, my father still had the opportunity to cross paths with Yaz a couple more times. 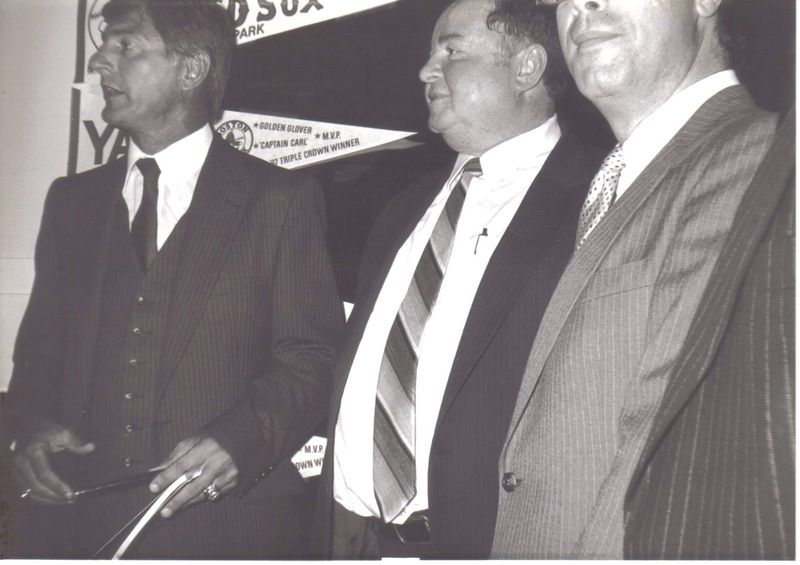 A few weeks after hanging up his cleats, the Massachusetts Congressional Delegation honored the Red Sox superstar with a "Carl Yastrzemski Day" reception at the Rayburn House Office Building in Washington, D.C. By virtue of their association with Yastrzemski, my father and his boss Sidney were invited to attend the party which Kahn's-Hillshire Farm provided kielbasa for. 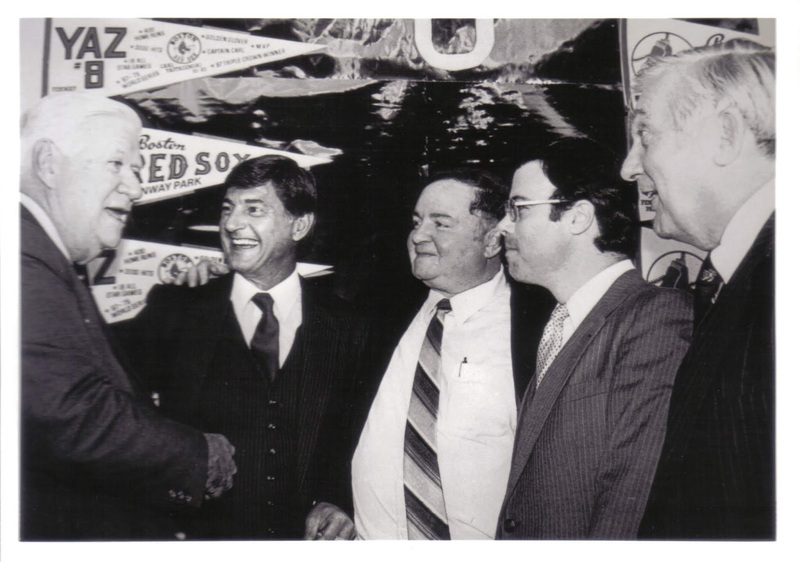 During the reception, my father and Sidney got to briefly meet and have their pictures taken with Massachusetts Representative Silvio Conte and Speaker of the House Thomas "Tip" O'Neill, both of whom were close friends of Yaz and avid Red Sox fans. While growing up in Massachusetts, O'Neill was given his nickname by his boyhood friends after James "Tip" O'Neill, a 19th century ballplayer who shared his surname. 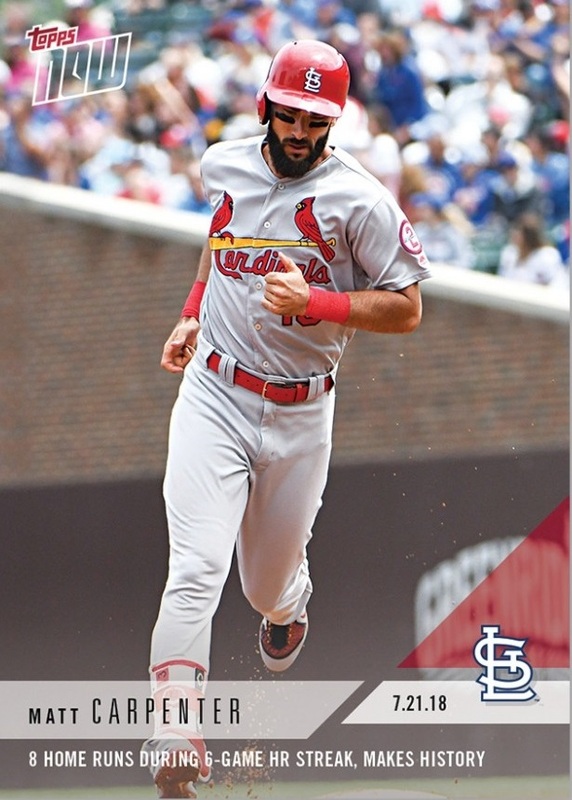 Coincidentally, "Tip" O'Neill, along with Yastrzemski, is one of just fifteen sluggers credited with winning the Triple Crown, having led the American Association in home runs, RBI, and batting average in 1887. However, O'Neill's accomplishment was unbeknownst to anyone at the time as RBI did become an official stat until 1920. 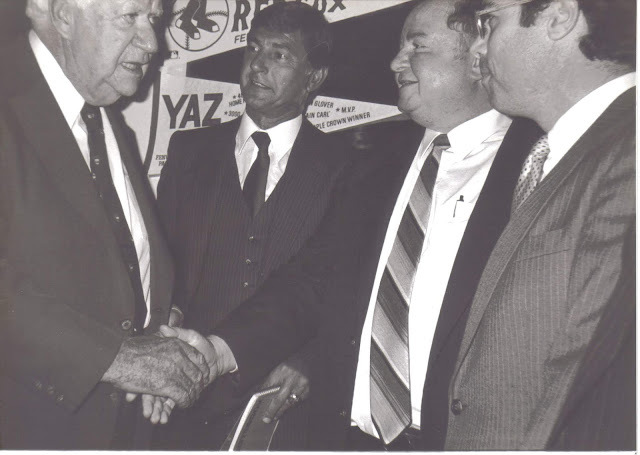 (L to R) O'Neill, Yaz, Sidney, my father Jack, & Massachusetts Representative Silvio Conte at "Carl Yastrzemski Day"
My father and Sidney had another neat experience involving O'Neill due to their association with Yastrzemski. "In August 1985, the company had their national sales meeting in Washington, D.C.," my father remembers. "After a morning meeting, we went on a tour of the Senate and House of Representatives office buildings. While everyone was on tour, myself, Sidney, and the salesmen from New England--six, seven, maybe eight of us in total--went on a special side trip. Yaz had it worked out so that we could all go by "Tip" O'Neill's office and get a picture taken of us sitting at his desk while he was away at Congress. “Tip" O’Neill’s staff let us in and I even got to put my feet on his desk with a cigar in my mouth. Yaz set all that up." Although my father is not a sports fan, he made a point of saving keepsakes and memorabilia from his time working with Yastrzemski to give to my sister and me. 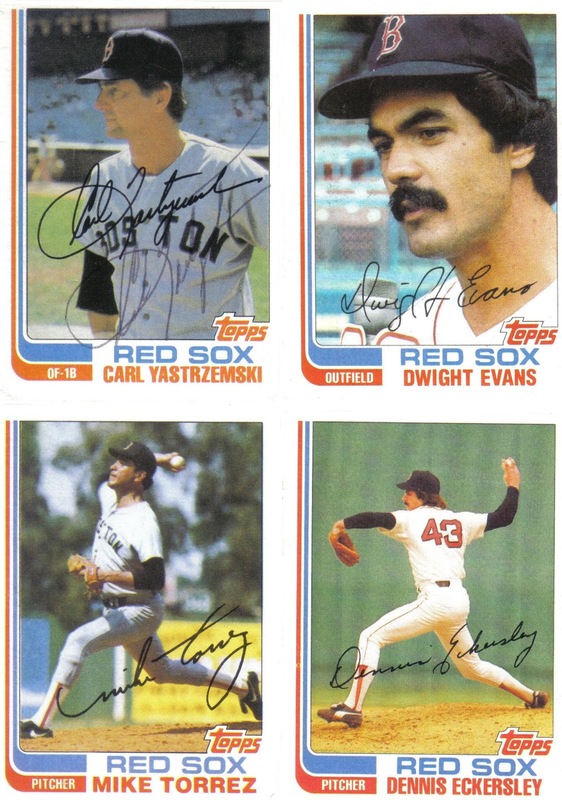 Many of these keepsakes were given directly to my father by Yastrzemski. Among them are autographed baseballs signed by Yastrzemski to my sister and me. Unfortunately even though the autographed baseballs were kept in enclosed glass displays, Yastrzemski’s signature has faded over time. 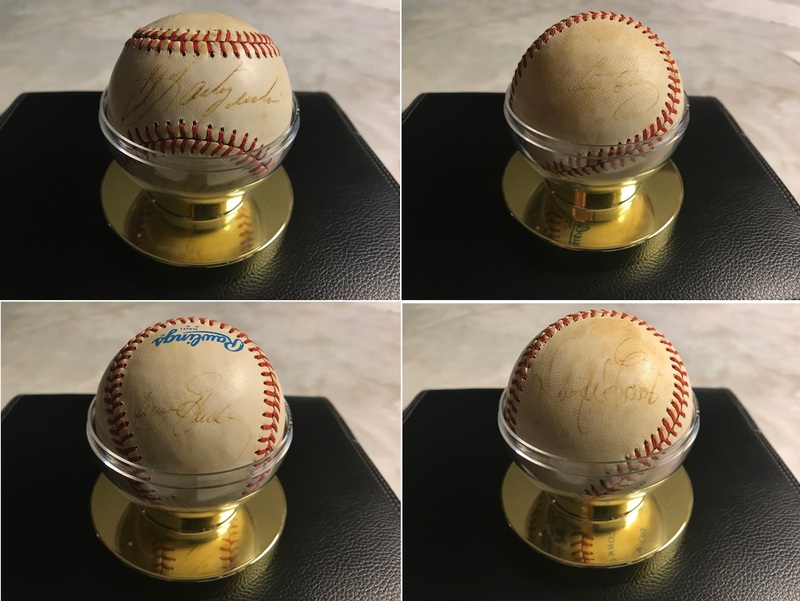 Another signed Yastrzemski ball included autographs of three of his Red Sox teammates, Mike Torrez, Dennis Eckersley, and Dwight Evans. Based on the signatures of the three players sharing the ball with Yaz, my father was given the signed ball during the 1981 or 1982 season. Over the years, as I learned more about Torrez, Eckersley, and Evans, the ball has come to have more meaning for me. Mike Torrez is largely remembered for giving up Bucky Dent's go-ahead three-run home run during the one-game playoff between the Red Sox and Yankees for 1978 AL East Divisional Title. Ironically, Torrez had won two World Series games as a member of the Yankees to help them defeat the Los Angeles Dodgers during the previous year's Fall Classic before signing as a free agent with Boston for 1978. Despite surrendering the infamous-Dent home run, Torrez had a solid 18-year career with 185 wins--60 of which came during five seasons with Boston. Hall of Famer Dennis Eckersley had some of his finest and worst seasons as a starter for the Red Sox before becoming a dominant reliever with the Oakland Athletics. 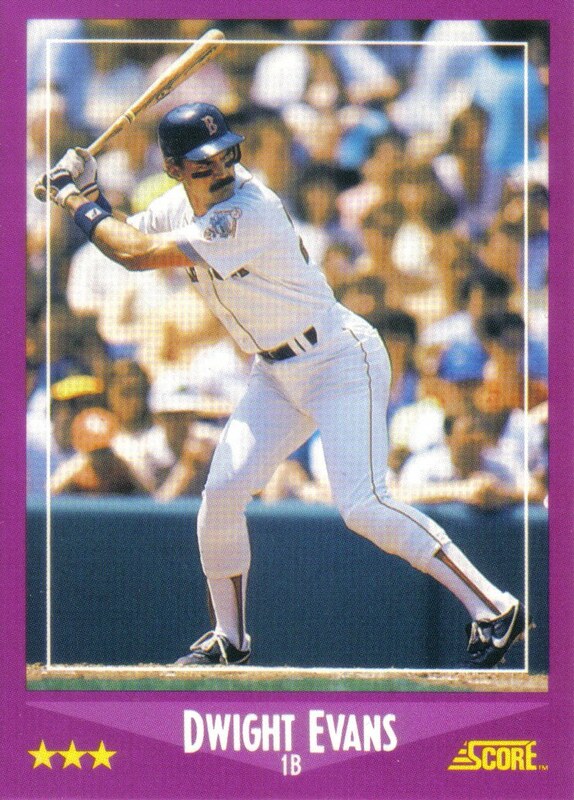 During his incredible 1992 campaign in which he won both the AL Cy Young and MVP Awards, "Eck" became one of my all-time favorite players after watching his ESPN interview with Peter Gammons. 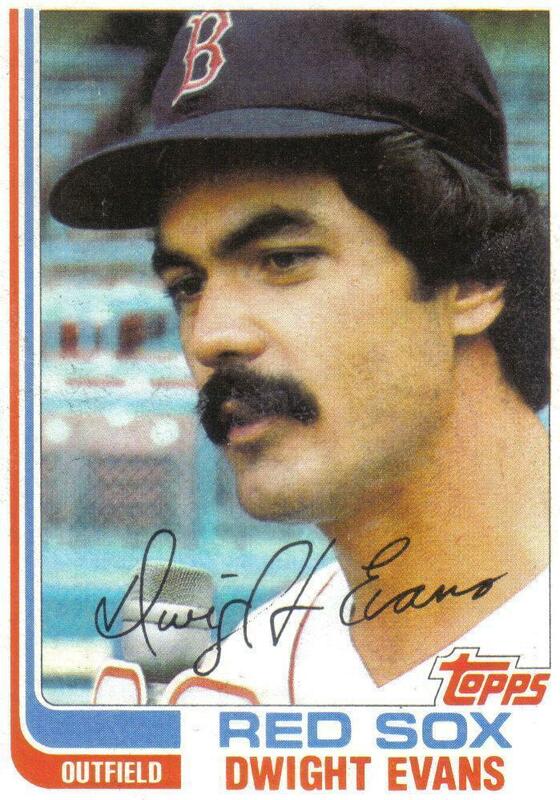 Dwight Evans' 2,505 games played in a Red Sox uniform trails only Yastrzemski. When my father would recount his time working alongside Yaz, Evans' kindness always stood out to me. 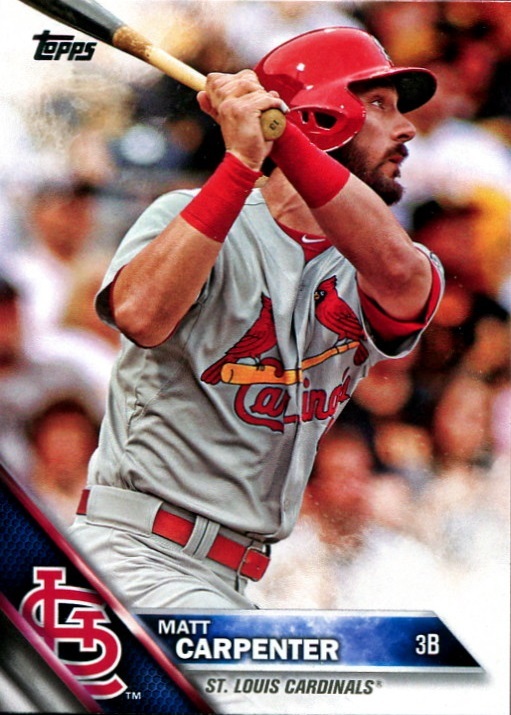 Evans finished his career with nearly 2,500 hits and 400 home runs along with eight Gold Glove Awards for his sensational defense in right field. 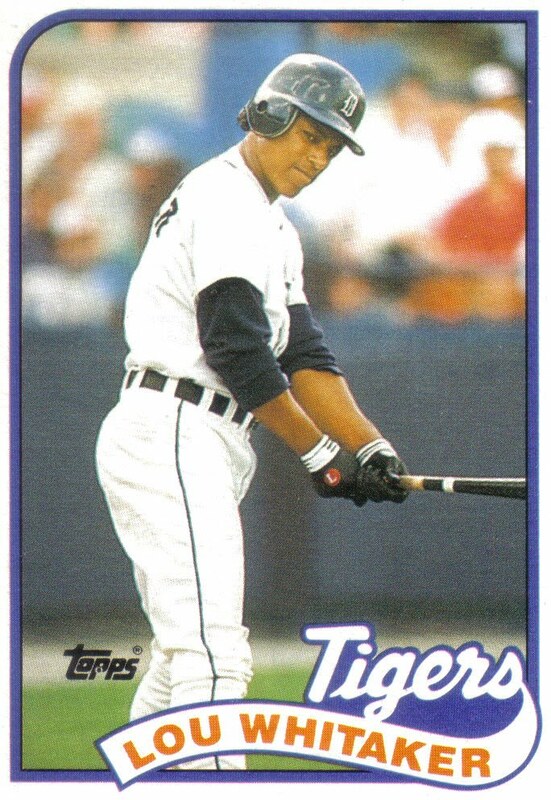 In my early twenties, I became interested in evaluating players with strong careers who were overlooked by Hall of Fame voters and I was surprised to find Evans had fallen short of Cooperstown. Years later when I created my Tubbs Baseball Blog website, Evans became my favorite overlooked Hall of Fame candidate to write about. After receiving positive feedback from supermarket buyers during the playoffs and World Series, Kahn's-Hillshire Farm decided to continue using Orioles baseball tickets to strengthen their relationships with grocers. "Because I had a good response of giving out the Orioles playoff and World Series tickets then, later that Fall after the World Series, the company made up their mind they would buy me a set of four season tickets for the '84 season," my father explained. The seats my father and Sidney picked out were much closer to the action than the ones given to them for the previous year's playoffs. The seats they selected were once again a little past the first base bag but now only about twenty rows away from the field. While most of those tickets were given to supermarket buyers, my father took our family to a lot of games as well. 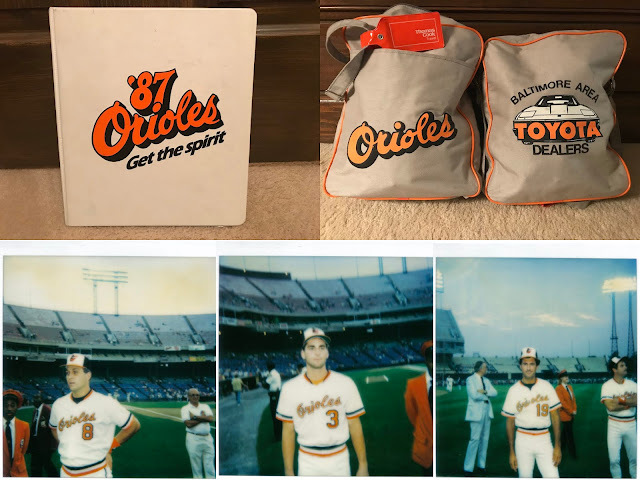 My father says he specifically set aside some Sunday afternoon games to take us to and my sister told me that he made a point to take us to ones that included promotions or giveaways such as On Field Photo Night, Bat Day, Sport Bag Night, and Back-to-School Binder Night. My sister and I held onto most of the giveaways we received at the O's games. Over the next few years, my father took our family to several Orioles games each season. Unfortunately, the O's struggled to follow up their championship campaign, languishing as an also-ran team in 1984 and 1985 after spending much of the previous decade and a half as a perennial contender in the AL East. The O's appeared ready to turn things around in 1986, sitting just a few games out of the AL East lead in early August before completely collapsing over the season's final two months to embarrassingly finish dead last in their division for the first time since the franchise moved to Baltimore. The O's continued to struggle mightily in 1987 and were only saved from finishing in the AL East cellar by a dreadful Cleveland Indians team. During those particularly difficult '86 and '87 seasons, my sister and I were among the few fans who passionately cheered "Eddie!!! Eddie!!!" for the O's beleaguered first baseman Eddie Murray who was regularly booed by the Baltimore fans after a public contract squabble with team owner Edward Bennett Williams turned much of the fan base against him. 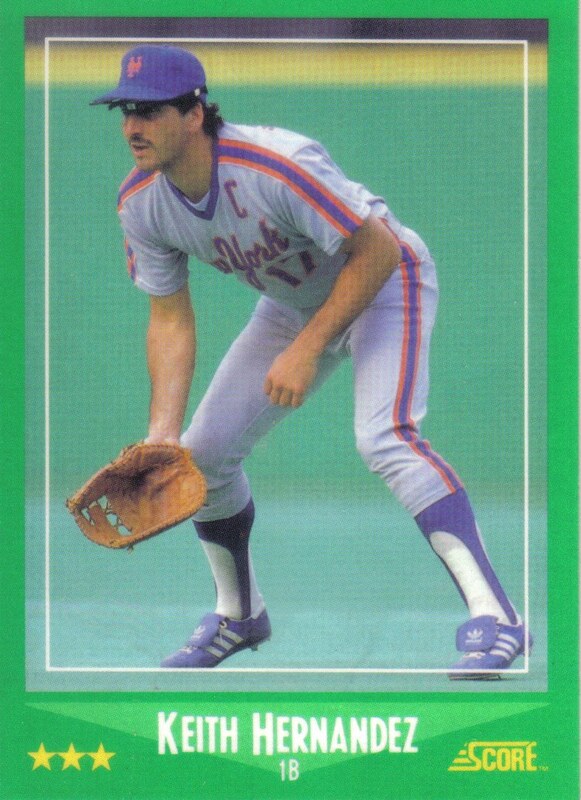 Shortly after the conclusion of the 1987 season, my father left Kahn's-Hillshire Farm and moved our family to Virginia. My father remembers his final interaction with the Red Sox legend, "We had a national sales meeting in Boston in 1986 and I remember that this was the last time I saw Yaz. He came over to where the salesmen were having supper that night and ate with us." In 1989, Yastrzemski's playing career was forever immortalized with his induction into the Baseball Hall of Fame. Even though our family moved away from a baseball town, going to Orioles games and growing up with the stories, baseball cards, autographed memorabilia, and keepsakes from my father's time working alongside Yastrzemski helped shape me into a lifelong baseball fan.